Last week I escaped the concrete jungle of Calgary and explored a new part of the province. I ventured about 3.5 hours northwest to the Drayton Valley area for the two-day Alberta Farm Writers Association (AFWA) annual farm tour. For those of you who are familiar with the province of Alberta, I’m sure the first thing that comes to mind when you think of the Drayton Valley area is oil, not agriculture. And yes, oil is the economic driver of the area, but agriculture is also present in various forms and over the years the two have learned to co-exist. After nasty weather earlier in the week in various parts of the province, we were fortunate to have beautiful weather for the tour. 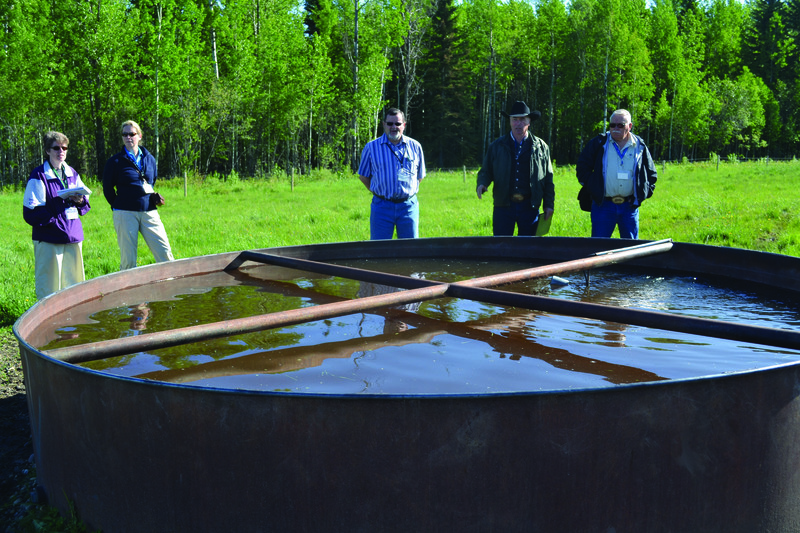 Our first stop was the Pembina Grazing Reserve which was established in the 1980s and consists of about 19,000 acres around Drayton Valley. The Pembina Grazing Reserve began because farmers wanted summer grazing. 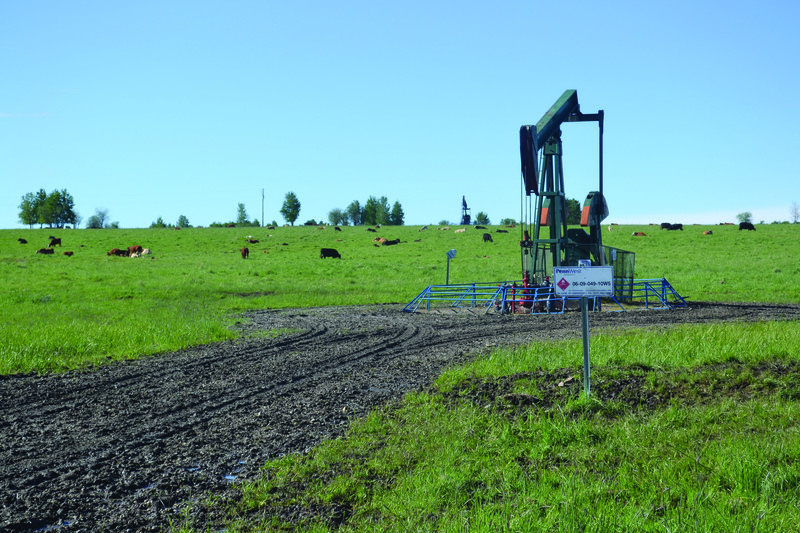 The reserve land is riddled with more than 200 oil wells and so far about 2,000 acres have been lost to oil production. There are currently about 1,400 cow-calf pairs on the reserve broken into five herds which participate in a rotational grazing system. The dugouts are all fenced off and the water is pumped to troughs for the cattle to drink. 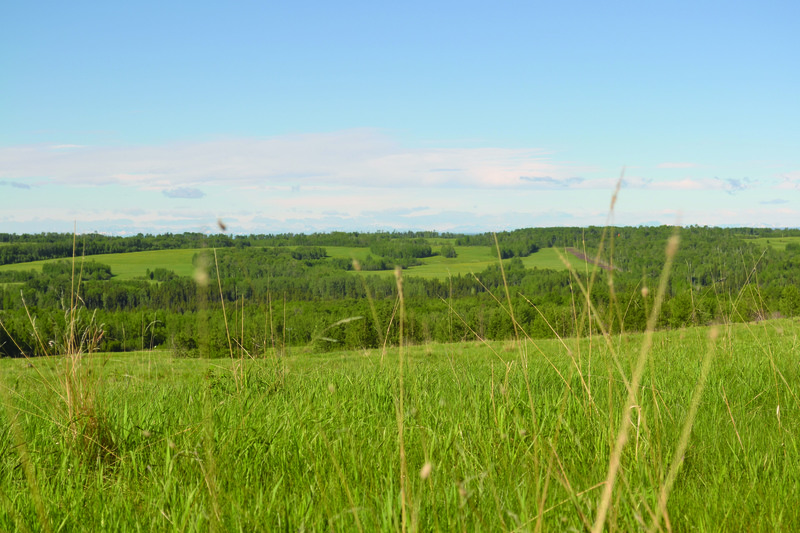 Fun Fact: There is approximately 120 miles of fence throughout the Pembina Grazing Reserve. Cattle grazing among the oil derricks. Cattle grazing around our bus. The beautiful view from one of the pastures. You can see the mountains in the distance. A fenced off dugout and solar panels. A water trough for the cattle. 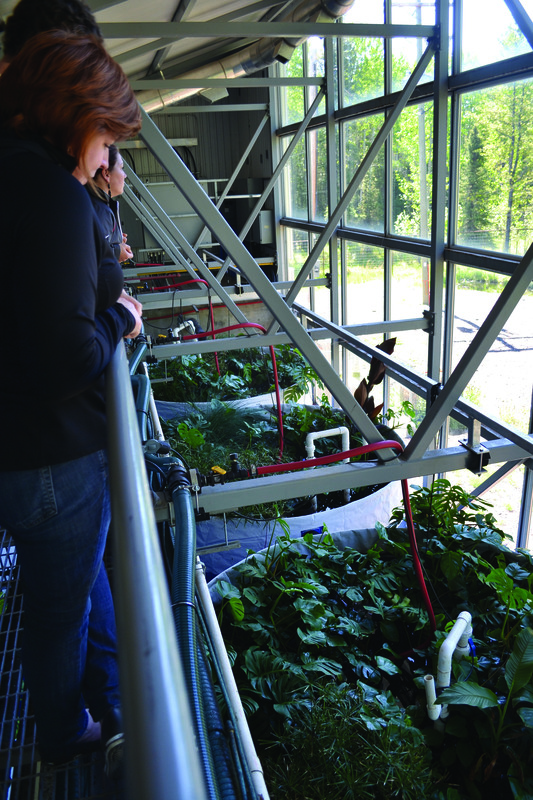 Our next stop was the Cynthia Solar Aquatics Water Reclamation Facility in the hamlet of Cynthia. (A hamlet is a small settlement in a rural area that has no local government). The facility was built out of a need to replace the existing lagoon. The community wanted to pursue an environmentally friendly way of dealing with their sewage. 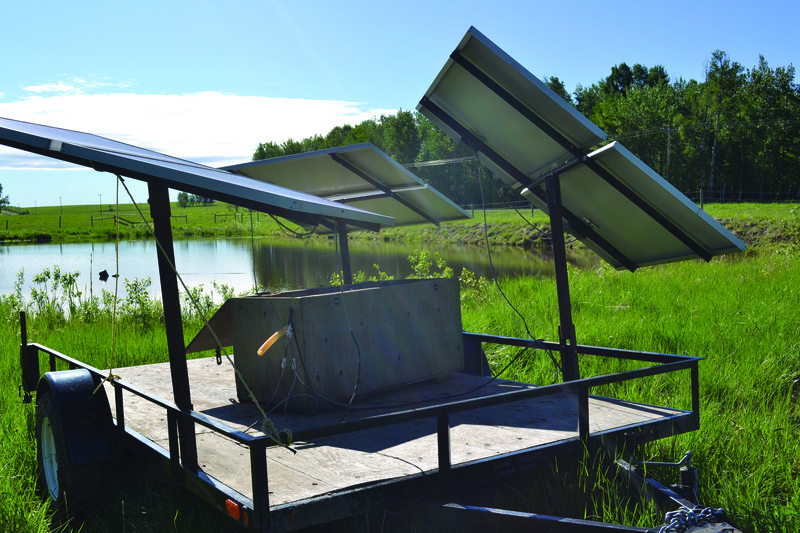 So Brazeau County built a Solar Aquatics system complete with a high-efficiency building, heat recovery and solar hot water. This is the first facility of its kind in a colder climate. If successful, it could be an alternative to lagoons elsewhere. 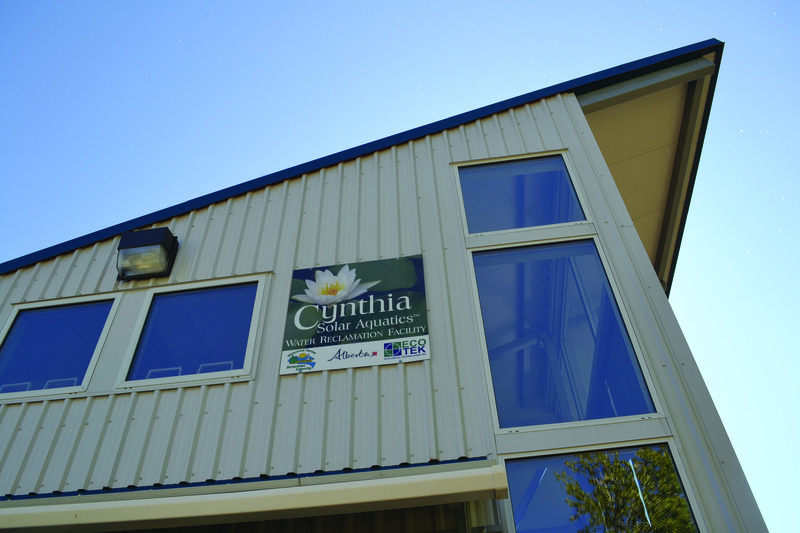 The $1.8 million Water Reclamation Facility in Cynthia, AB. The huge tanks inside the Water Reclamation Facility. Looking down on the tanks. 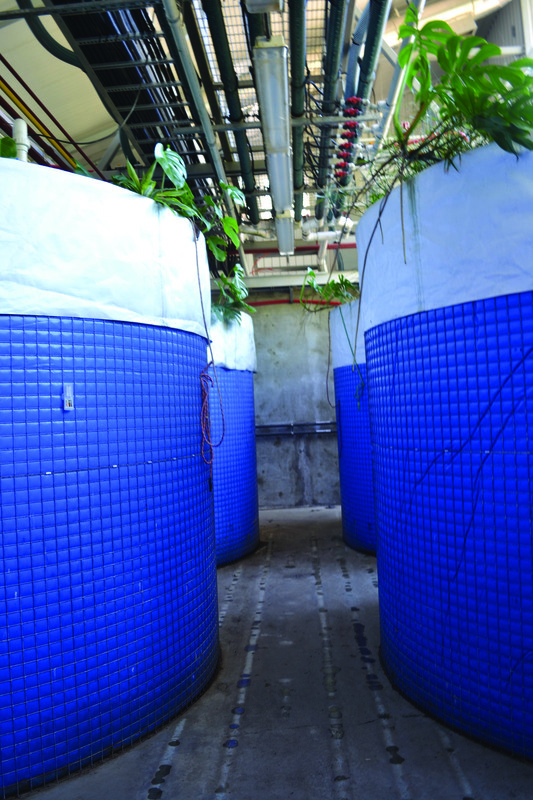 There are plants growing out of the top of the tanks from the nutrients. We drove to a local community hall where our lunch was catered by the 100 Kilometre Kitchen Party. Three local ladies have teamed up for this initiative. 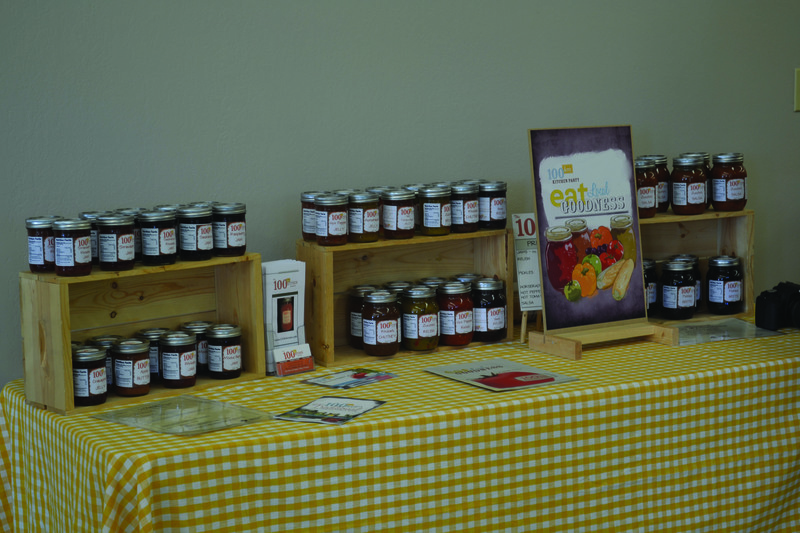 Using their own tried and true recipes, they produce a variety of canned goods including jams and jellies, and then sell them at various farmers’ markets. They support local growers by sourcing as many ingredients as possible locally – within 100 kilometres. They continue to sell out of their products every year. And their goal is to create a full-time business out of the initiative. Delicious products sold by the 100K Kitchen Party. Our final tour stop of the day was Sekura Auctions in Drayton Valley. The Sekura family operates a livestock auction mart and farm equipment auctions. The father Wendell built the business from the ground up many years ago and his sons have now taken over. 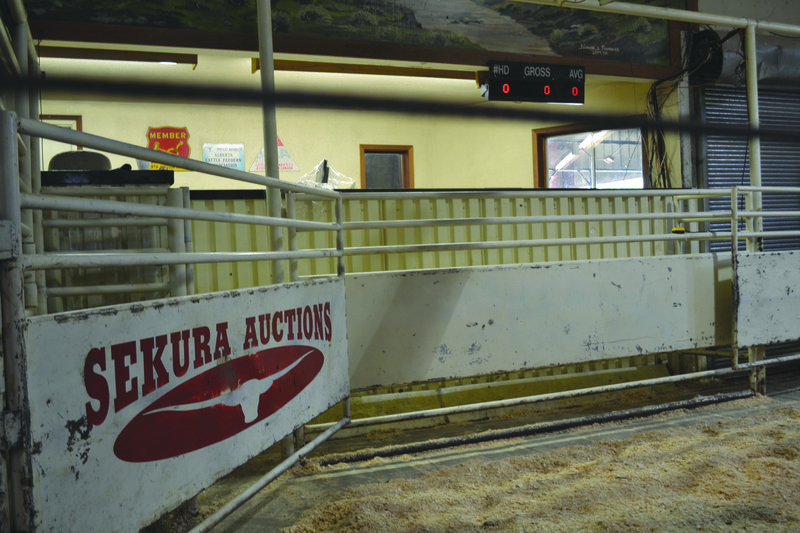 The Sekura’s shared stories of how the livestock industry in the area has changed over the years and what those changes have meant for the auction mart business. The ring at the Sekura Auction Mart in Drayton Valley. 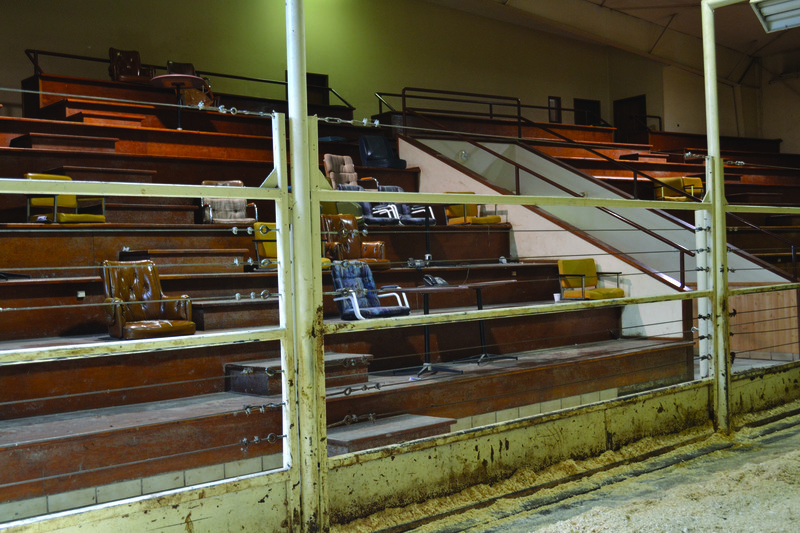 The stands in the auction mart which some buyers and sellers have customized by bringing in their own seats. We awoke to more sunshine the next day. 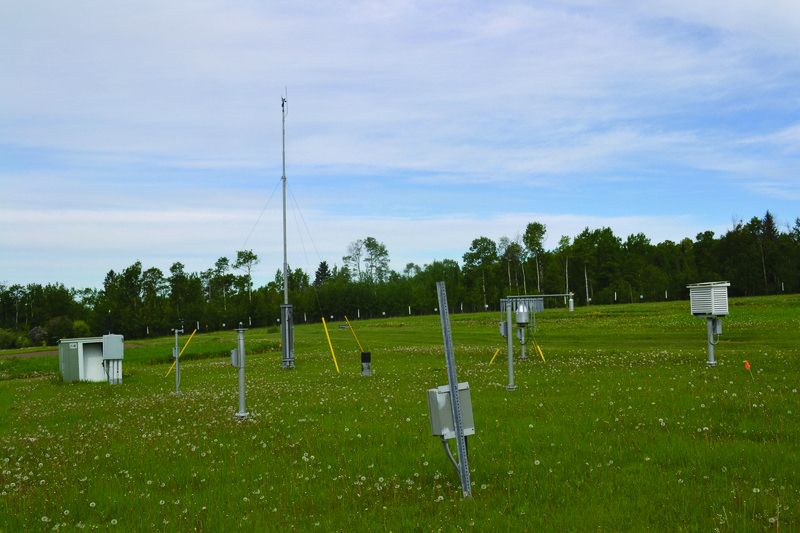 Our first stop was the Breton Plots, a University of Alberta Department of Soil Science initiative. The long-term plots were established in 1930 and are currently on about 20 acres. 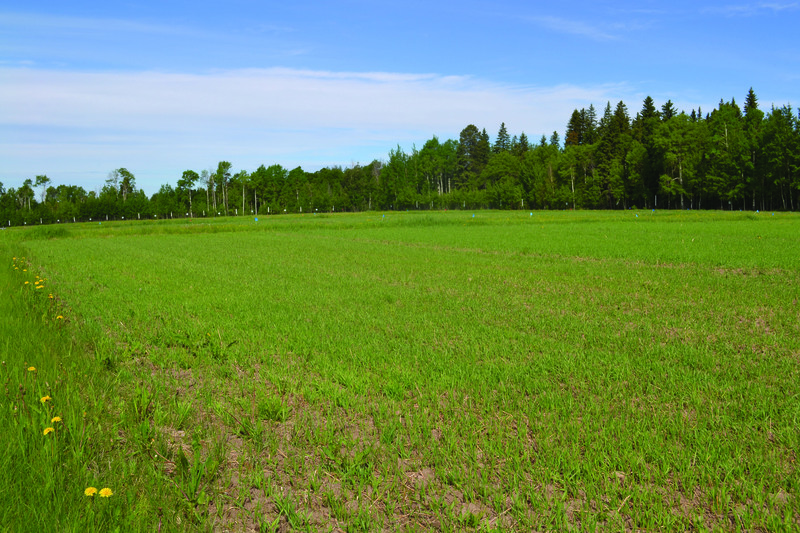 The original plots known as the Classical Plots are currently on a five-year rotation of wheat, oats, barley, hay, hay. The plots, which are 28 ft by 103 ft in size, are located on grey wooded soils which are low in nutrients, particularly nitrogen. Various rates of N (nitrogen), P (phosphorus), K (potassium) and S (sulphur) are experimented with on the plots. This year the plots were seeded on May 16 and have not yet been sprayed with herbicides. There are also newer trials taking place at this location. 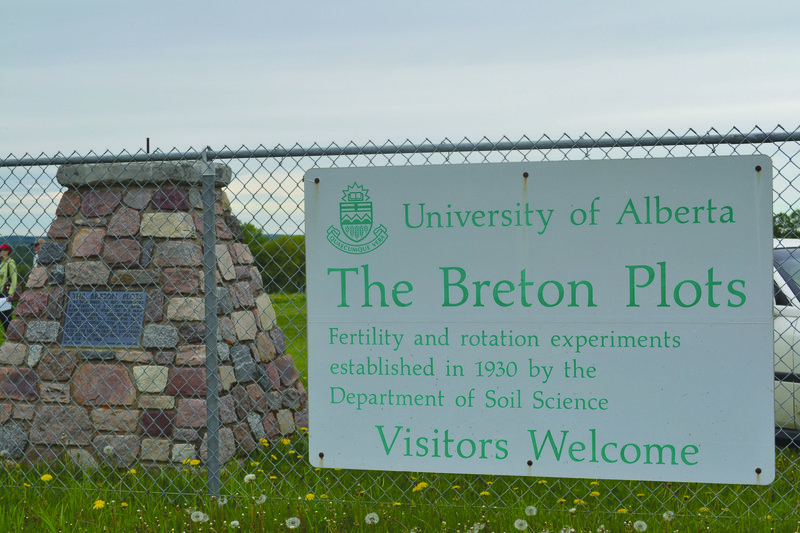 The University of Alberta Breton Plots. Part of the Breton Plots. The weather station at the Breton Plots. Our final stop on the tour was the Breton and District Historical Museum which focuses on four major themes: Black History, the Lumbering Industry, Community Development and Agricultural Development. I’ve shared my thoughts before on this blog about the importance of belonging to associations and organizations within your industry. I was a member of the Manitoba Farm Writers and Broadcasters Association prior to moving west this past winter. I found that to be a valuable experience which led me to joining the Alberta association. This was my first AFWA event and I met many new friends. I look forward to participating in more AFWA events.